Our first design, the hugely successful 31′ Aztec dominated Dublin and Solent racing. 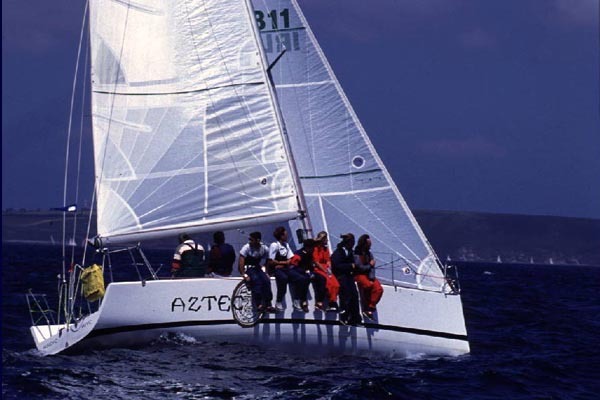 “AZTEC”, the first product of a collaboration between Mills Design and Mizzen Marine of Dublin, hit the water in early May 1996 for a successful Irish yachtsman who wanted a simple, clean and inexpensive to build design which could succeed in the medium light Dublin conditions under CHS, now called IRC. Mizzen Marine partners Garrett Connolly, Irish Olympic crew in the Solings in 1996, and David Harte, successful Teachers Round Britain ’95 skipper, were instrumental in the development of this design aided by builders Darragh Peelo and Robin Evans, and they encouraged Team Dennis Connor boatbuilder Johnny Smullen to bring his high tech experience to bear, ensuring a world class result for the first custom yacht designed and built in Ireland since 1988. Aztec began by winning her first race by 3.5 minutes, five days after first touching the water! 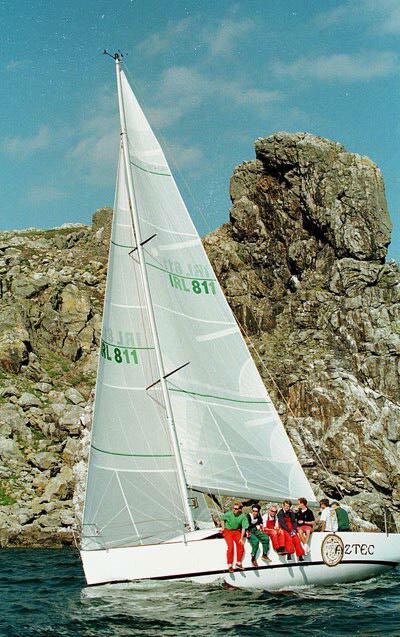 The Irish yachting magazine Afloat summed it up: “A lonely sight out in front, Aztec romped around the course to win convincingly by three minutes and twenty five seconds on handicap, never really having to race with her class mates.” In fact she caught a J35 which had started five minutes ahead! This was encouraging considering she had only been sailed once before heading out to the racecourse. This level of performance was maintained throughout the summer, winning the 13 race May to September Carlsberg Superleague series, and on into the winter. 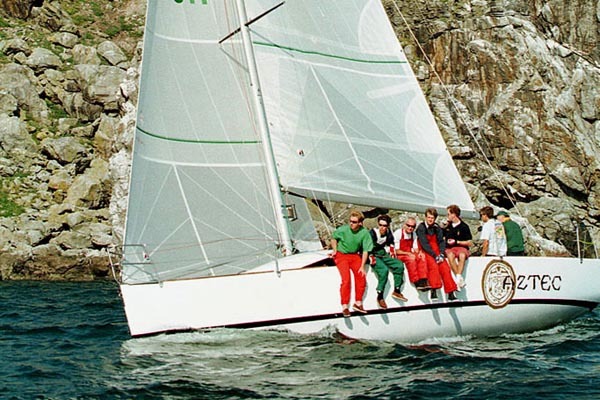 The Afloat report of the six race 211 entry Nissan Autumn League said “As expected, Dun Laoghaire’s 32 footer Aztec completed her debut season with a convincing win in Class 1…” In 1997 she moved with her owner Peter Beamish to the Solent and has continued her winning streak there as well where she “…stole the scene” according to Yachts and Yachting by winning class 2 in the Warsash Spring Series, and the Commodores Cup for winner of the largest class in the 240 boat event. In the one weekend off in the middle of that series she won the 3 day RORC Red Funnel Easter Challenge series for good measure! 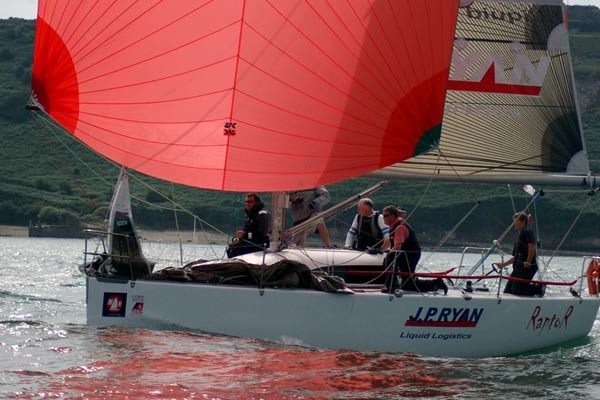 Similarly during the HRSC Winter Series, in which she won Class 2 with a 1, 1, 1, 1, 1, 3 scoreline, she also won the John Merricks Regatta in Lymington. Tailored originally for a 1.018 CHS rating, “AZTEC” combined a number of rule oriented features such as a high ballast ratio, narrow waterline beam, medium displacement tailored to the expected conditions, and a rule-optimised rig. Some restraint was exercised regarding rule “beating” factors to avoid integrating unwholesome design elements, and to ensure the design had a long racing lifespan. 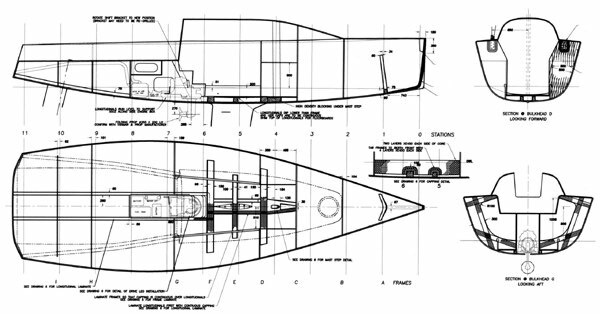 The hull design centers around a narrow round-sectioned shape for light air speed. This low-resistance hull shape combined with plenty of sail area goes well in lighter conditions, while when the breeze picks up the high stability produced by the large keel bulb ensures that there is sufficient stability to stay in the hunt upwind. 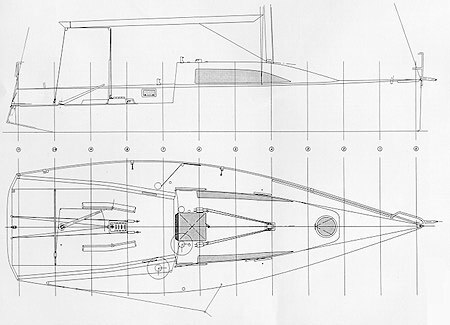 Since CHS then encouraged higher displacements the overall weight of the design is heavier than optimum, but a long waterline allows her to be re-optimised in future with less weight without sacrificing performance. 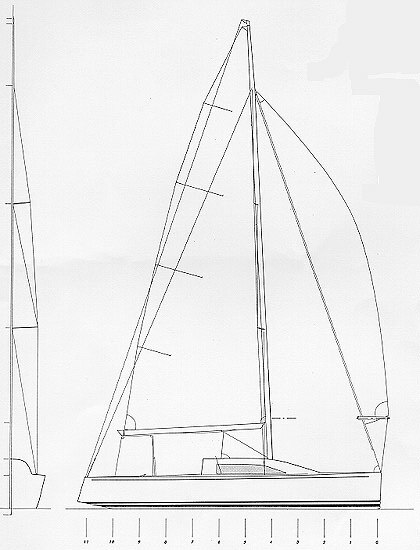 The deck plan was designed with round the buoys racing in mind, boasting a large cockpit, Americas Cup style asymmetric spinnakers, and a layout directly descended from Grand Prix yachts. This arrangement is primarily dedicated to the focused style of sailing found in day races. Major suppliers Spinlock and Harken have both helped by providing gear customised to suit our requirements. A basic interior with standing headroom provides four berths, a galley and a nav station, with a head forwards, finished in matte white epoxy and trimmed with teak.The original rig is a Proctor two spreader fractional arrangement with 48.7 sq. m.. of sail area, optimised for CHS. The aft swept spreaders reduce the reliance on running backstays, providing an extra margin of security during tricky maneuvers. This rig configuration was chosen for CHS due to its low rating profile, greater ease of shifting gears in changing conditions and for its simplicity. With CHS rules governing spinnakers altered to allow asymmetrics without penalty, they play a significant role in the downwind inventory, rewarding increased crew work with a demonstrable edge downwind. The keel and all-composite rudder both use state of the art sections and planforms, with the large laminar flow sectioned bulb on the keel offering maximum stability at the lowest cost in terms of drag and displacement. The foils are designed to offer excellent feel and balance, and possess enough area that they are not super-critical to steer to.The engineering was performed and supplied electronically via the Internet by John Fox of FCS in the US, allowing immediate access and communication. Formerly in charge of new projects at Carroll Marine, and before that with the high tech custom Goetz yard, John has produced the most refined structure appropriate for a cedar cored hull.